M.J. WILLIAMS, vocalist, trombone player and Montana native plays both locally and regionally. She has co-founded several bands and trios, and has performed at festivals such as the New York City Women in Jazz Festival, the Bellevue Jazz Festival and the Bumbershoot Jazz Festival. She has produced a standards album, By All Means (1987), and co-produced two trio albums, What We Had in Mind (1996) and Taking the Hook (1997). 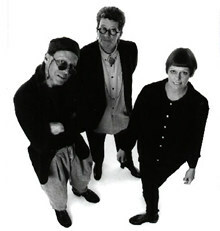 A fourth album, I Can Hear Your Heart, is her latest release (1999). Pianist ANN TAPPAN grew up in New York where she started playing the piano at age four. After studying jazz composition and arranging in college, she studied with ECM pianist Art Lande, later becoming an instructor at this school in Berkeley. In 1993 she migrated to Montana where she both performs and teaches music. Since coming to Montana she has recorded four CDs with the groups Threeform, Springhill, and MJ Williams Trio. She has performed widely in the Northwest including concerts at the Bumbershoot Arts Festival and Jazz Alley in Seattle. Montana native KELLY ROBERTY, acoustic bassist, has performed, toured or recorded with an unbelievable list of the music world's greatest. From Peter Gabriel and Dion Warwick to Tommy Flanagan, Eddie Harris, Ray Anderson, David Murray, and everyone in between. Having toured internationally for over a decade he has performed in almost every major jazz venue. As a composer and arranger he has dozens of recordings to his credit. His recent projects include teaching his own unique vision of improvisation in individual and workshop settings.